RAMA, having its Head Office at Mumbai, carries a quality professional experience of varied services. Partners, Directors and Senior Professionals have in-depth experience of more than 50 years in delivering clients acknowledged quality professional services of Risk Advisory & Management Assurance, Corporate Finance & Business Advisory and ERP Implementations. 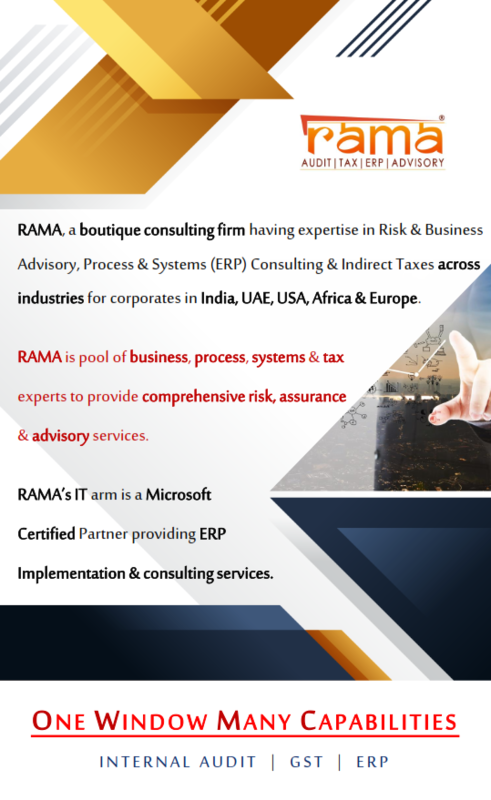 RAMA has an edge of a blended resource pool of CA, MBA, IT professionals and Subject Matter Experts, which enables to provide comprehensive services beyond the traditional way of auditing and consulting. Each and every assignment is executed professionally with a sole objective of adding value to client’s Business, Processes and Systems. The regular training programs (in-house and outside structured training programs) keep the skill level of workforce up-to-date with changes in laws, regulations and dynamic business scenarios. Use of IT technology enabled practices and audit tools helps in bringing better insights, newer solutions and best practices bench-marking. We adore and practice the values of profession. Our past and present credentials of working on varied challenging professional assignments with an economical and competitive edge, for SME to large size corp-orates of wide spectrum of industries, domestic and overseas projects, is the testimonial of RAMA’s professional capabilities to execute all sorts of professional assignments in its areas of practice. Our execution methodologies coupled with IT and Technology enabled tools are customized to meet specific needs of clients. The unique confluence of classicism and innovation, technology and tradition, professionalism and personalized interactions, helps us drill out the best-suited solution for all types of businesses operating in any industry-sector. Our prime goal is to deliver value added services to clients, but also to implant partnering approach in implementation of Assurance Recommendations to ensure client’s satisfaction on a continuous basis.